Call of Duty: Ghosts is a big hit but its sales are running significantly lower than last year's Call of Duty: Black Ops 2. Call of Duty: Ghosts may well be the best-selling game of the year, but it's still trailing Black Ops 2 sales by 19 percent year-over-year. Activision had previously warned that the transition between console generations would negatively impact sales, but analyst Doug Creutz of Cowen and Co. said the situation is worse than the publisher predicted. "Upon further reflection, we think the numbers are a bit more troubling than they first appeared," Creutz wrote in a note to investors. "While the year-over-year gap is only 19 percent thus far, that includes two extra weeks of sales for the 360 and PS3 versions. 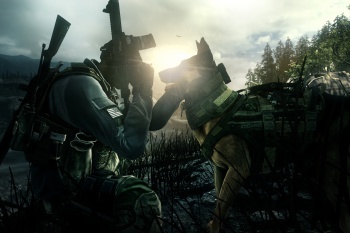 Against 2011′s [Modern Warfare 3], where the difference is only one week, the title is down 32 percent life-to-date." In other words, if Ghosts didn't have an extra week of sales (the PS3 and Xbox 360 versions of Ghosts came out November 5, while Black Ops 2 came out on November 12), the gap between it and Black Ops 2 would be even greater. The later release of the game on the PlayStation 4 and Xbox One accounts for some of the slide but Creutz said that neither console has enough of a user base to make up the overall difference. The gap could grow even wider over the vital month of December, he added, which would leave the game in a pretty bleak position. "We don't think it is out of the question that the title could wind up comparing down 20 percent to 25 percent year-over-year, which is appreciably worse than the down 10 to 15 percent that we think is baked in to guidance," he said.